With the arrival of hot weather, updates on hottest summer trends are here with StylesGap! Every day you’ll visit us you’ll find these updates and many styling informations. So is the designer dresses and branded collection’s updates, and without these, the fashion statement of a girl in this century won’t be completed. And for your styling, fashion and trendy dressing all the latest releases of designers are shared on this platform where a subject of today, is the “Zeniya”. In Collaboration with the Winner six Lux style awards, 2 MTV-style guru awards, best international designer at Miami fashion week, and a standing ovation in Milan fashion week; Deepak Perwani, Zeniya’s fashion house has launched its fresh collection for this summer. Another well-known and emerging name of the fashion market is now listed among the ones launching their arrays for coming season. Zeniya lawn spring/summer collection 2015 for women is the label under which this fresh ensemble is launched with an amazing introductory offer of 25% off! The collection is formed of the limited range of two piece dresses. Classic and chic ready to wear dresses in this assortment would make you look enough graceful to be poured into the souls of people in your surroundings. Both printed and printed plus embroidered dresses with nice printed sleeves, gala, neckline, and panels paired with pants and trousers are included in this collection. 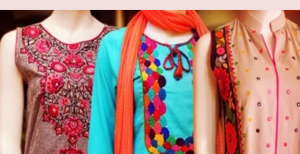 Designs vary from A-line, kaftan style, front cut short shirts, short frock and long shirts. 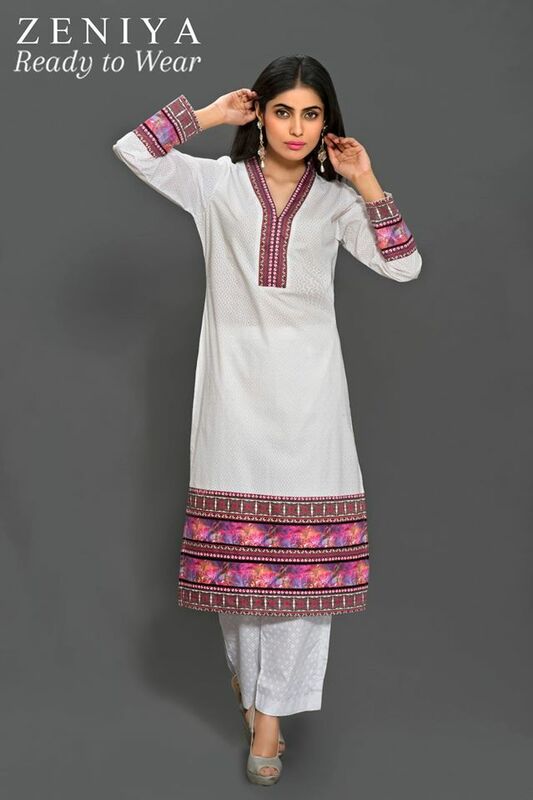 The Cool and comforting summer prints and ethnic patterns adorn the dresses stitched in an elegant way. Nice and subtle colors like white and sea green are used by the designer in most of the dresses while a few with darker hues of pink, and blacks, with more embroideries, can also be found in this assortment. Simple yet trendy, ethnic yet chic, and delicate yet brilliant designs are coming your way! Find your nearest store and explore the collection. Sounds rude? Okay we know this is not what you read at our website. 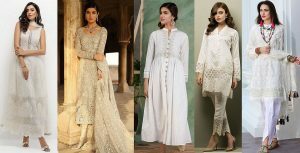 You don’t need to go out in the sun, visit the shop just to choose a design; find the images of the beautiful designs of Zeniya lawn spring/summer collection 2015 right here in the images of this post and choose the one you’d like to have in your summer closet. So get yourself ready for a divine and stylish season ahead with latest designer stuff and stay connected with us!